The Water Park in "The Way, Way Back" and "Grown Ups"
Have you seen the movies, The Way, Way Back or Grown Ups (or both), and wondered where the scenes at the water park were shot? In the 2013 coming-of-age drama/comedy, The Way, Way Back, a water park is prominently featured. The coming-of-age story centers on 14-year-old Duncan (Liam James). During an extended summer vacation, he takes a job at a nearby water park and bonds with the general manager. In the movie, the park is called Water Wizz. OK all of you 14-year-old boys (or adults with the minds of 14-year-old boys): You can stop giggling now. It turns out there really is a park named Water Wizz (what were its owners thinking? ), located in East Wareham, Massachusetts, which served as the location for the film. Other scenes were shot in and around Massachusetts. The Adam Sandler movie, Grown Ups (the original 2010 film, not the 2013 sequel), also used Water Wizz as a location. The goofy movie (which pretty much describes most Adam Sandler films) reunites high school buddies, which include characters played by David Spade, Chris Rock, and Kevin James, for a summer getaway. The water park plays a critical role in this film as well. The guys visit Water Wizz and, of course, hijinks ensue. Put a heavy dude (James) in a tube, send him down a slide, and you've got comedy gold—or so the makers of this film must have thought. What About the Water Park? The official name of the park is Water Wizz of Cape Cod. Technically, however, it is located just on the other side of the Cape Cod Canal and is not really on the Cape itself. Since it is an outdoor, seasonal park, you could visit it during the warmer months. But don't expect an enormous water park like Schlitterbahn in New Braunfels, Texas or a heavily themed one like Aquatica at SeaWorld Orlando. Water Wizz is an average-sized facility with a few decent slides, a lazy river, a wave pool, and the usual water park suspects. It doesn't offer anything too fancy like an uphill water coaster or a FlowRider surfing simulator. it does, however, boast a couple of moderately thrilling speed slides. Despite its reputation as a summer vacation hotspot, Cape Cod proper does not have any permanent outdoor water parks (or amusement parks, for that matter). It does, however, have plenty of incredible beaches for water fun in a more natural setting. 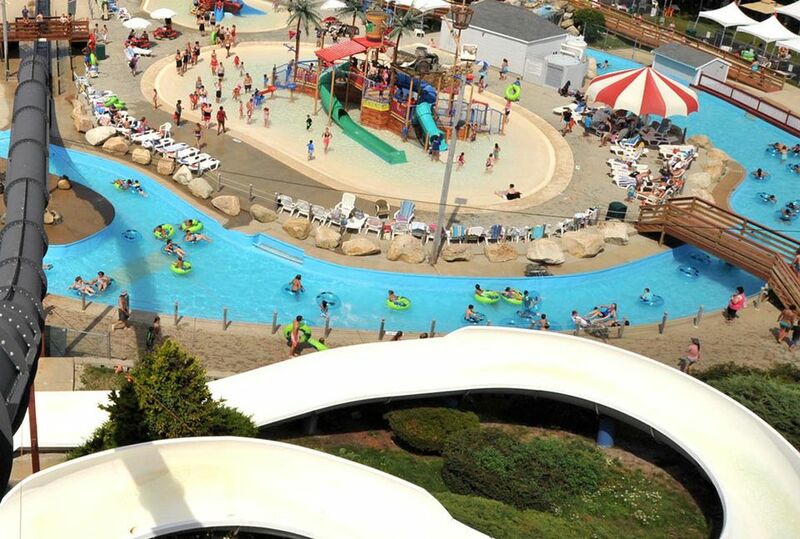 There is a tiny indoor water park that is open year round at the Cape Codder Resort in Hynannis. There is also a temporary attraction in West Yarmouth, the Cape Cod Inflatable Park. Each spring, its owners inflate a collection of dry and wet inflatable attractions. It charges a separate admission to enter The H2O and ride the inflatable water slides. If you are looking for other water parks that are relatively close to Cape Cod, you could visit Six Flags Hurricane Harbor at Six Flags New England in Agawam, Massachusetts or Water Country in southern New Hampshire. For a larger indoor water park, head to Great Wolf Lodge New England in Fitchburg, Massachusetts.